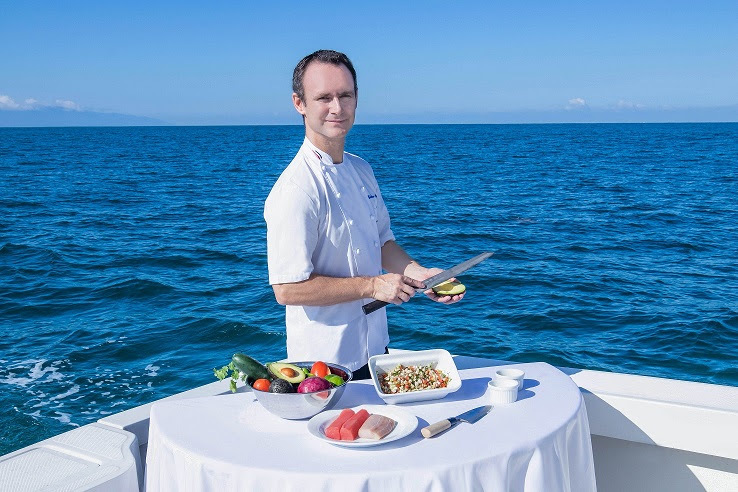 Riviera Nayarit, Mexico (November 7, 2018) – The AAA Five Diamond Grand Velas Riviera Nayarit has launched a new way for guests to enjoy fish straight from the sea. Guests can bring along a resort chef on a 4 to 6-hour fishing expedition in the Banderas Bay. As catches are made and pulled in, the chef will prepare several dishes to enjoy on deck, including Zihuatanejo-style fish strips, tuna ceviche with mango and habanero chili, fish tartar with tomato and avocado, sashimi, and Carpaccio. For guests who don’t find luck during their time onboard Beluga, a 32 ft. Luhrs sportfishing boat, the chef will have a cooler of fish available to prepare some culinary delights. Captain, fishing equipment and bait are also included. Other Velas Resorts also offer complimentary fresh catch experiences. At the AAA Five Diamond Grand Velas Riviera Maya, a fishing boat will bring fresh fish, like grouper and snapper, from the water just off the resort’s shore to the chef to directly prepare on the beach grill. Additionally, the boutique adults-only Casa Velas in Puerto Vallarta has traditional panga fishermen bring their fresh catch to the chef at its Ocean Club on Banderas Bay to prepare for guests. Rates for the Grand Velas Riviera Nayarit fishing experience start at $1265 for up to 7 pax. Cost is in addition to Velas Resorts’ all-inclusive rates which include luxury accommodations, a la carte gourmet meals at a variety of specialty restaurants, premium branded beverages, 24-hour in-suite service, taxes, gratuity and more. Nightly rates start at $320 per person per night at Casa Velas, $395 per person per night at Grand Velas Riviera Nayarit and $434 per person per night at Grand Velas Riviera Maya. For reservations or more information, please call 1-888-407-4869 or visit https://vallarta.grandvelas.com/. Offering unparalleled all-inclusive experiences, Velas Resorts in Riviera Maya, Puerto Vallarta, Riviera Nayarit and Los Cabos have earned 52 AAA Diamonds, including the prestigious Five Diamond Award. Other esteemed international awards for their services and facilities include Virtuoso’s “Best Spa,” Forbes’ “Coolest All-Inclusives,” Forbes’ Four Star Award, and TripAdvisor’s Hall of Fame, among others. Properties include the AAA Five Diamond Grand Velas in Los Cabos, with dramatic ocean views and unique spaces infusing every area of the resort; AAA Five Diamond Grand Velas Riviera Nayarit, which enjoys a privileged natural setting with flowering, landscaped gardens beside a long stretch of pristine beach and a dramatic backdrop of the Sierra Madre mountains; and AAA Five Diamond Grand Velas Riviera Maya, located five minutes from Playa del Carmen, offering a sophisticated all-inclusive resort experience in the Caribbean with jungle and beach settings. In Puerto Vallarta, Casa Velas is a boutique adults- only hotel and ocean club located on the Marina Vallarta Golf Course, and Velas Vallarta, a family-friendly all suites resort and spa located on Banderas Bay. Velas Resorts feature spacious accommodations, spas, a unique culinary experience at a selection of restaurants, 24-hour in suite service, fitness centers, personal concierge service, wedding inspections for couples, state of the art conference centers, extensive family programs, fully stocked mini bar and more. Eduardo Vela Ruiz, founder and president of Velas Resorts, operates Velas Resorts with brother Juan Vela, vice president of Velas Resorts, by his side. For reservations or more information, call 1-888-407-4869, email reservations@velasresorts.com or visit https://www.velasresorts.com.